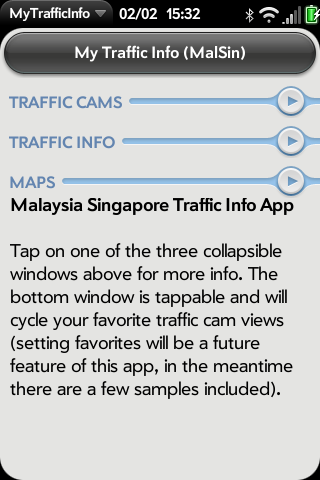 Traffic information application for Malaysia and Singapore comprising links to traffic cams, traffic podcasts, public transport information and a map of the KL Light Rail Transit. v 0.6.5 - added more traffic cams, and button links to location on Google map. v 0.7.2 - added some LDP cams, added GPS function and ability to view current location on Google map within the app. v 1.0.0 - major update and re-write of the app. All available traffic cams from ITIS and LLM are now listed. LiteFM traffic podcast feed links play the audio directly now. v 1.1.0 Improved the KLTraffic twitter feed display and tapping on it shows tweet in an internal card view. v 1.5.0 Revamped app with new design incorporating collapsible windows to squeeze more info into the screen. Added Singapore traffic cams.